Tokyo is generally thought of as a modern Japanese metropolis. And it is! But behind the bright lights and towering buildings there are hidden gems dotted around the city. Full of tiny bars and eateries, these winding alleyways are a holdover from a different time, and offer some of the city's most unique drinking, dining and nightlife experiences. Despite Tokyo's ultra-modern aesthetic, there are pockets of tradition scattered throughout the concrete jungle. These yokocho, literally "alley" or "backstreet," feel like time warps, transporting visitors to the bygone days of the Showa Period (1926 - 1989). While the buildings in most yokocho are structurally relics of the past, their place in the modern world is evident in their distinct character, which is highlighted by the fact that they teem with life, especially after dark. Lined with tiny bars, crammed beside and on top of one another in a kind of ordered chaos, they provide the perfect opportunity for a smokey, chaotic night of bar hopping with a friend or two. Historically Tokyo's yokocho bars were strictly the haunts of local, middle-aged salarymen, and they still make up the majority of the patrons. But most places welcome customers of all stripes, and as a result the alleyways of Tokyo are home to some of the most authentic experiences a tourist could ask for. The best part is that they're spread across the city—sometimes tucked away where you'd least expect it—which means you're never too far from one. The following five are some of the best, and should definitely be at the top of your "to do" list. Golden Gai is a warren of six low-rise, dimly lit alleyways in an area of Shinjuku that is otherwise dominated by skyscrapers, LEDs and oversized TV screens. It's hardly secret, since it's regarded as one of the city's best tourist attractions, but it contains over 250 ramshackle bars squeezed into an area that is roughly the size of a football field. It's striking just how "out of place" it can feel, juxtaposed against the ultra-modern entertainment hub of Shinjuku's Kabukicho—which is a short walk away. In many ways, it's amazing that Golden Gai exists at all. Not only is it architecturally inefficient, but it somehow withstood the tides of modernization that swept across downtown Tokyo, which saw many similarly constructed areas bulldozed for urban development. Thankfully the area isn't merely alive, but thriving, and we can all reap the rewards. The beauty of Golden Gai is both in its aesthetic and in its variety. 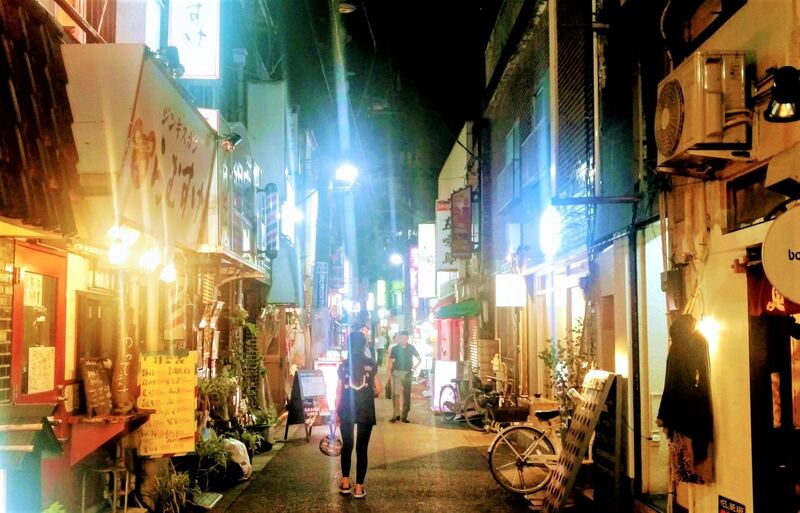 Wandering the tight, neon-lit alleys at night feels special in itself, and the sheer number of tiny watering holes means you're spoiled for choice. The themes of the bars range from pop culture and video games to heavy metal and karaoke, and collectively they may also have one of the largest collections of spirits to be found in the city. Most bars tend to offer a wide range of local sake and shochu, along with a litany of whiskies from Japan and the rest of the world. There are a couple of things to note before making your way to Golden Gai, however. Expect to pay a cover charge in most bars. It's typically between ¥500 - ¥1000, though some can be even more expensive. Almost all of the bars seat 10 or fewer people, so if you go in a large group, don't expect to be able to hop from place to place together. While most places are tourist-friendly (a menu outside with English is a good indicator), some can be less welcoming—use your judgment if you feel like you aren't being warmly received, and hit up one of the countless other bars nearby. Located near Shibuya Station, Nonbei Yokocho, aka "Drunkard's Alley," is not dissimilar to Golden Gai. It's in stark contrast to the buzzing, metropolitan area in which it is located—the famous Shibuya scramble is just a skip away. It is considerably smaller in scale however, as Nonbei Yokocho only consists of two parallel alleys lined with tiny bars and restaurants. Lit by lanterns along the narrow walkways, the small area gives off a salubrious and welcoming aura. Many of the bars here appear to be nameless, and operate more like a local's living room that just so happens to be open to the public. Again, room is sparse, but the draw is in the charming character that each little establishment exudes. Consider it Shibuya's less-touristy alternative to Golden Gai. Located in northern Tokyo, Kita-Senju is rarely touted as a must-visit area of the city. Even so, it's home to a fantastic collection of yokocho that really come to life at night, especially on weekends. Located outside the Chiyoda Line exits of Kita-Senju Station, they have a charming, distinctly Japanese aesthetic—narrow walkways, low hanging electrical wires, an array of colorful lanterns and signs and a variety of local establishments lining the streets. There are little izakaya and ramen shops home to raucous business men with Friday night fever, red-faced and guzzling down noodles and sake. These are interspersed with little bars, with rustic wooden décor pulled straight out of a bygone era. There are also some particularly tasty-looking yakiniku restaurants—the store fronts often showcase a mouth-watering smorgasbord of delectable meats and veggies. While most bars and restaurants are more traditional in their alcoholic offerings, there's also a fantastic craft beer café with a wide selection of brews, many of which are hard to come by elsewhere in Japan. Kichijoji's Harmonica Yokocho provides another great outlet for experiencing the delights of Tokyo's alleyway drinking and dining scene. Located on the north side of Kichijoji Station, it's a cavernous maze known for its quirky standing-only bars and for its collection of excellent restaurants. Like much of Tokyo's yokocho, Harmonica sprouted up in the post-war period, and gained popularity in the '90s. It was during these years that many small, high-quality, restaurants opened up in the area—most of which are still satisfying customers today. The quality is matched by the range of foods on offer with gyoza, yakitori, ramen and even taiyaki on the center stage. Asakusa is most commonly known as the home of Senso-ji, Tokyo's oldest Buddhist temple. However, it is also an entertainment district that's home to an 80-meter-long (about 262 feet) street running down the temple's western side called Hoppy Dori ("Hoppy Street"). The street is named after the low-alcohol (only .8%), beer-like drink, Hoppy, which is commonly mixed with Japanese shochu in a drink sometimes called "Half and Half." It forgoes the cramped confines that are usually indicative of Tokyo's yokocho in favor of wide streets and fewer establishments that can seat larger amounts of people. Hoppy Dori might not exude the same type of character found in some of the more archaic-looking alleyways of Tokyo, but it makes up for it with its large outdoor seating areas—a rarity in a city where resourcefulness of space is usually paramount. During warmer times of year, the wide streets and beer gardens at the front of the bars and restaurants are the perfect place for an ice-cold beer while soaking up some sun.